I have a 2009 Dodge Ram truck. When I turn the heat, air, or defrost on it is not working. Nothing is coming on. I have a 1998 Ford Ranger Truck that the Heater Module Switch went bad. A/C works fine but it doesn't do much good as a defroster. The 12 volt Defroster that are sold are about 12 Watts and don't do anything, don't waste your money. What I did was buy a 400/800 Peak Watt Inverter, an extension cord and a 200 Watt Lashko Heater, total cost $60. I place the heater on the dash on a rubber mat so it doesn't slide and turn on the heat and use the blower on low to distribute the heat. It dried up the moisture and defrosted my windshield just fine. My girl friend placed it on the floor boards and heated up the cab in no time. It was made to handle a office cubicle so a truck cab is no problem. There is no tip over switch on the heater so care must be used. It's only 200 Watts and the Inverter handled it with no problem. When I shut down, I shut off the Inverter so it doesn't drain my battery. Only problem it scrambles the AM radio signals but not FM, I can live with that when its C-O-L-D.
How do I fix my 2008 Dodge Ram1500 heater? When I adjust my heater to the floor it goes to the defrosters. Sound like the blender door in your heater has broken. My heater only blows air on the highest setting. No air comes out on low or mid settings. My blower motor went out and I replaced it, but now it only blows on high. I have a 2006 Ram 1500 truck. Check your blower motor resistor I think it's under your glove box. I have a 2003 Dodge Ram 1500. The only thing that works is the blower. There is no heat, no AC and it won't switch from defrost. I checked the fuses and tried two different control switches. You may have a bad blender door actuator. If you are not handy, you may want to call the dealer or your mechanic! I have found the older the vehicle, the worse DIY projects turn out, but that is just me and my bad luck! It may just be that your hose has come loose but I would suggest you take your Dodge to a local auto parts store (or maybe more than one?) (Auto Zone, NAPA, Advance Auto, Pep Boys) and ask them if they can help you locate the problem. Many times there is someone that knows about a problem and can assist you - if not at one - go to the next. I have always had very good luck and good information from all of these stores. I have a 1999 Dodge Ram 2500. At first the heater/ac wouldn't blend. Now on top of that, the fan motor only works on high. And no matter what you select only the defroster works. From what I have read , a dainty blend door actuator causes problems like this. I would go the the NHTSA site and check for recalls. You can input your vehicle identification number. This will give you a list of recalls. If your problem with your car is a recall, it will be able to be fixed for free. I am getting great heat on all vents except the floor vent. I can't detect any heat coming from that one. My feet are constantly cold, here in Maine. Is there a tube that sends hot air just to the floor that might be disconnected? So a car may be different than a truck, but when I had (still have unfortunately) issues with my 07 car, I was told that the cold weather (we had a terrible cold streak a few years ago and one morning when I turned the heat on I heard a loud SNAP and no longer got air from the bottom vent). He said that freeze caused the cable to the actuater (I am not sure I am spelling that right) to snap and that in my car's case, the parts are dirt cheap, but the labor is killer because they have to take apart the entire dashboard to fix it. I trust my mechanic as he has cared previous cars and he has never steered (yes, pun intended) me wrong. He said the car can live for years without it, and if I didn't fix it it harms nothing. The thrifty person I am, I didn't fix it (still have the car) and I learned to wear extra socks and fur lined boots in the Pittsburgh winters. Hope your car is less expensive to fix than mine! Wishing you good thoughts for an easy fix! Can you manually change the cold to heat under the dash on a 1997 Dodge Ram truck? The control knob on the dash does not seem to be moving anything, it moves way too freely. If I can change it from cold to hot under the dash please help me. I am freezing when I drive the truck. Did you ever get an answer to this problem ? My 1500 blows only cold air - the temp knob doesn't switch from cold to hot air, just blows cold all the time. I drive a '02 Ram 1500. I have no idea whats going on with my heat. The passenger side blows hot air, but it cools down. And the drive said blows cool air. I've replaced the heater core, and the thermostat twice. I also replaced the radiator. I've gotten all the air out of the lines. I'm not sure if it's just a vent in the hvac unit. The top of the dash is missing and when I drive with my window open I can hear one of the vent doors open and close really loudly. The blend door actuator could be faulty. We had no heat and no leaking fluids. My husband changed the thermostat and still no heat. Any suggestions? Not saying this will work, but I drove the front end of my Lincoln up on car ramps. I cracked open the reservoir cap and squeezed the upper hose to force air out of the system. You will see air bubbles arise in the reservoir.Then close the cap tightly. My 2007 Ram 1500 has a heater blower motor that stops working when I put the brake on. When I give it gas it starts blowing. It will do this awile and then stop working all together. Anyone have any ideas? 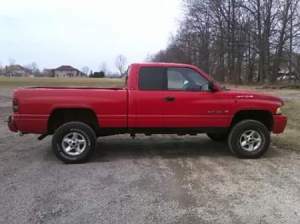 I just purchased a 1997 Dodge Ram Sport. The owner informed me that a part was needed on the firewall conected to the two hoses coming from heater core. What part or parts are they? I have a 2003 Dodge Ram 1500 with the auto start installed well over a year ago to help either cool or warm up the truck, in the good city of brotherly love. As of this week, the blower in the truck remains on even when the truck is turned off. My trusted mechanic who has been working on vehicles for many moons is scratching his head. Any suggestions on what it may be? My 2008 Dodge Ram 1500 pick up truck blower on the heater/air cond (HVAC) starts and stops with no warning. Changing the blower dial makes no difference. I still get cold and hot air, but no air flow. When it works it works like normal, but all of a sudden it will quit with no warning and who knows when it will start again. I have a '96 Dodge Ram 2500 5.9 and the heat/ac is blowing lukewarm air on hot and nice and cold on a/c. The heater hoses in and out of the heater core are equal to temp of radiator hoses (nice and hot, 195 to 200 degrees). There is nice air movement, but just not getting hot enough. Could it be my blend door? I have an '05 Ram 1500 and the blower won't blow. I've checked power to the motor and resistor. I checked all fuses I could find, and I checked my selector switch. What do I need to do or check? I have a 2001 Dodge Ram 1500. My heat works in 50 degree weather, but not below. The AC works great. I have heat blowing from the passenger side vents, but cold air from the driver side vents. I was told to blowout my heatercore to unclog. Is this true? My 1999 Dodge Ram swaps from cold to hot and back randomly. What could be the problem?